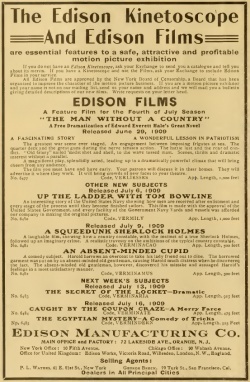 A Squeedunk Sherlock Holmes is an American silent movie released on 9 july 1909, produced by Edison Manufacturing Co. / Edison Films, referenced #6481, code VERMINACAO. 500 feet. Black & White. A laughable film, showing how a country constable, with the instinct of a true Sherlock Holmes, followed up an imaginary crime. A realistic travesty on the ambitions of the typical country constable. No. 6481. Code VERMINACAO. App. Length, 500 feet. A SQUEEDUNK SHERLOCK HOLMES. — Brilliant with sunshine, glad with the whispering wind coquetting with the leaves, yet it was only a scene of horror to H. Septimus Hunks, constable of Squeedunk township, b'gosh. On jutting rocks were drops of human blood, the grass was trampled and over there the mark of a woman's heel. With a mind trained to acute criminal observation through long experience in chasing delinquent debtors and arresting over-happy farmers who had supped too long of the cider when it was hard, he reconstructed at a glance the whole awful tragedy. Love and hatred, there was the cause. He could even hear the frenzied woman's scream still lingering amid the sighing trees. Iron though he was, he shuddered at the horrible tragedy these mute rocks had gazed upon, and was off like a shot to arouse the countryside. His duty was plain. He would track down the perpetrators of this fearful deed and catch them ere the body of their victim was cold. He would prove to a palpitating world that the brains of Squeedunk were equal to any emergency. 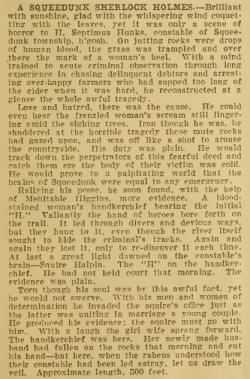 Rallying his posse, he soon found, with the help of Mehltable Higgins, more evidence. A bloodstained woman's handkerchief bearing the initial "H." Valiantly the hand of heroes bore forth on the trail. It led through divers and devious ways, but they hung to it, even though the river itself sought to hide the criminal's tracks. Again and again they lost it, only to re-discover it each time. At last a great light dawned on the constable's brain—Squire Halpin. The "H" on the handkerchief. He had not held court that morning. The evidence was plain. Torn though his soul was by this awful fact, yet he would not swerve. With his men and women of determination he invaded the squire's office just as the latter was uniting in marriage a young couple. He produced his evidence; the squire must go with him. With a laugh the girl wife sprang forward. The handkerchief was hers. Her newly made husband had fallen on the rocks that morning and cut his hand—but here, when the rubeus understood how their constable had been led astray, let us draw the veil. Approximate length, 500 feet. "A Sqeedunk Sherlock Holmes." — The Edison people have given a good burlesque of the average detective story in this film which has the photographic quality of their recent work. It is unquestionably as good a comedy as they have turned out in a long time, and the audience shows its appreciation in its hearty laughter. The acting is quite in keeping with the subject and is as smooth and even as the Edison actors usually are. As a welcome break from the far too frequent monotony of gloom and death this film is a decided success. It deserves a long run. This page was last edited on 20 January 2016, at 16:59.